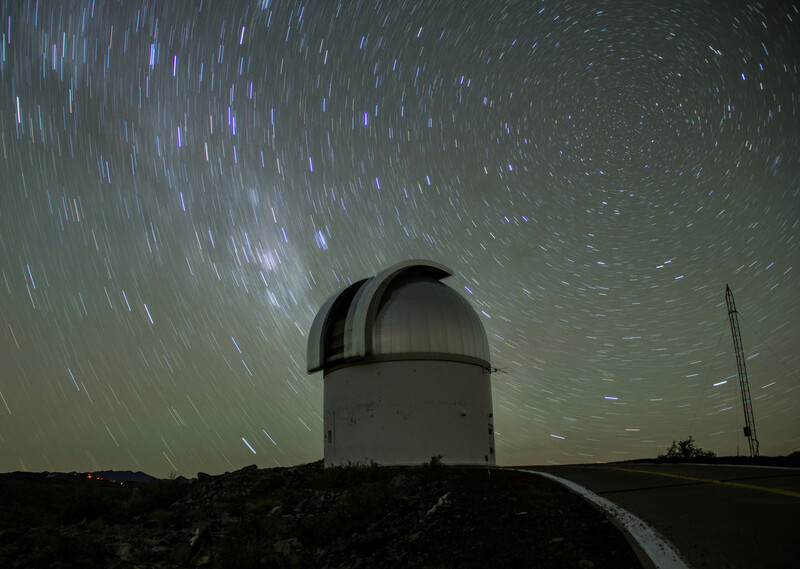 The first optical image of a gravitational wave source was taken by a team led by Ryan Foley of UC Santa Cruz using the Swope Telescope at the Carnegie Institution's Las Campanas Observatory in Chile. 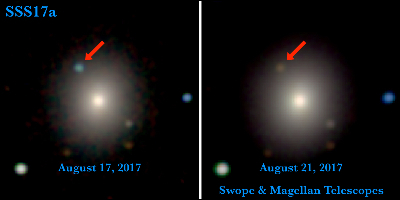 This image of Swope Supernova Survey 2017a (SSS17a, indicated by arrow) shows the light emitted from the cataclysmic merger of two neutron stars. (Left): A Hubble Space Telescope image from 4 months before SSS17a was discovered. (Right): The discovery image of SSS17a obtained from the Henrietta Swope Telescope at Las Campanas Observatory. The image was obtained on 2017 August 17 at 23:33 UT. SSS17a is marked with the red arrow. No object is present in the Hubble image at the position of SSS17a. 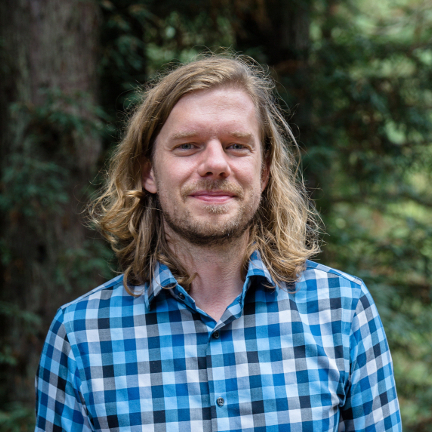 At the time of the GW170817 alert, D. Coulter, R. Foley, and M. Siebert were at the Dark Cosmology Centre in Copenhagen, Denmark, while C. Kilpatrick and C. Rojas-Bravo were in Santa Cruz, California. Meanwhile, B. Shappee, J. Simon, and N. Ulloa were at Las Campanas Observatory with M. Drout supporting from Pasadena, California. 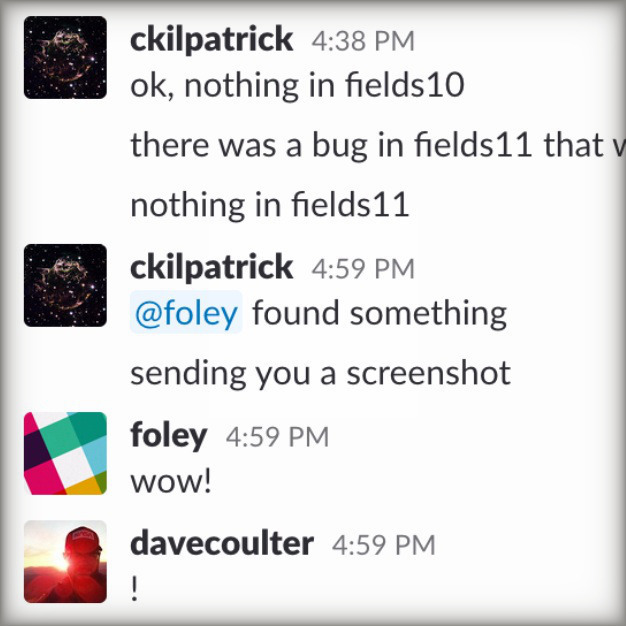 Both because of the multiple locations and for its speed, we used Slack to communicate. 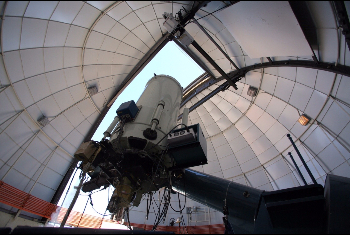 Here is our conversation, which includes the timeline of our evolving strategy and discovery of SSS17a. All times displayed are Pacific Daylight Time. Swope and Magellan telescope optical and near-infrared images of the first optical counterpart to a gravitational wave source, SSS17a, in its galaxy, NGC 4993. 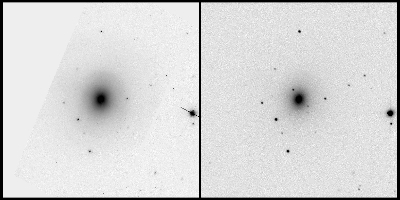 The left image is from August 17, 2017, 11 hours after the LIGO/Virgo detection of the gravitational wave source, and contains the first optical photons of a gravitational wave source. The right image is from 4 days later. SSS17a, which is the aftermath of a neutron star merger, is marked with a red arrow. On the first night, SSS17a was relatively bright and blue. In only a few days, it faded significantly and its color became much redder. These observations show that heavy elements like gold and platinum were created in the neutron star merger. 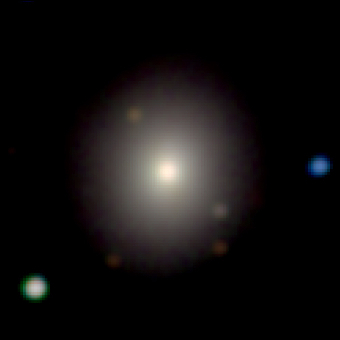 A pseudo-color image of NGC 4993 and SSS17a. SSS17a is the blue source to the upper-left of the center of the image. The red, green, and blue colors correspond to H-band, i-band, and g-band images. 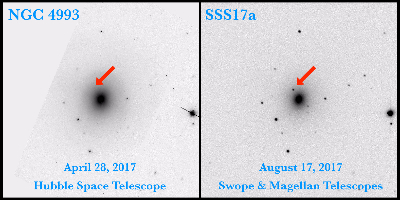 The images were taken on the night of discovery, 2017 August 17, 0.5 days after the neutron star merger that led to SSS17a. A pseudo-color image of NGC 4993 and SSS17a. SSS17a is the red source to the upper-left of the center of the image. The red, green, and blue colors correspond to H-band, i-band, and g-band images. 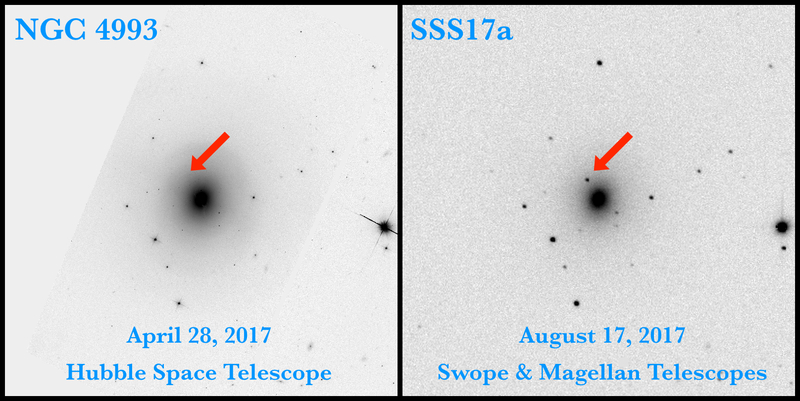 The images were taken on the night of 2017 August 21, 4.5 days after the neutron star merger that led to SSS17a. The gravitational-wave position of GW170817. 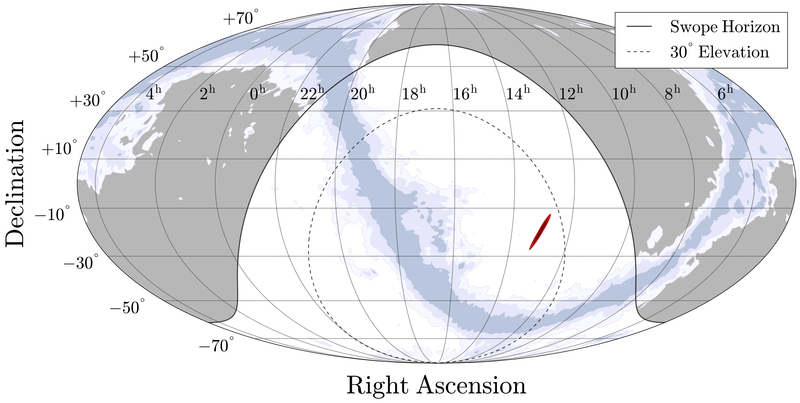 The outer edge of the red region represents the 90th-percentile confidence region as calculated by LIGO. Also shown is the Milky Way in blue for context. 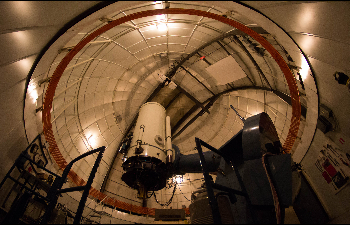 The thick solid line represents the horizon as seen from the Swope telescope on 2017 August 17 at 23:33 UT, the time we observed SSS17a. The dotted line represents an elevation above the horizon of 30°. Detail of the 90th-percentile confidence region. 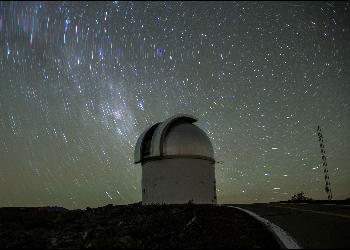 Grey circles represent the locations of galaxies in our galaxy catalog and observed by the Swope telescope on 2017 August 17-18 to search for the EM counterpart to GW170817. 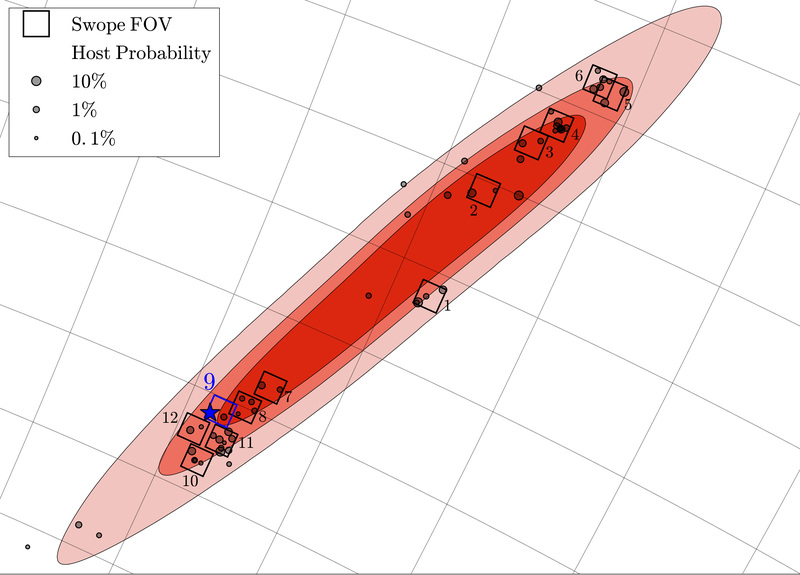 The size of the circle indicates the probability of a particular galaxy being the host galaxy for GW170817. The square regions represent individual Swope pointings with the solid squares specifically chosen to contain multiple galaxies. The blue square labeled ’9’ contains NGC 4993, whose location is marked by the blue star, and SSS17a. 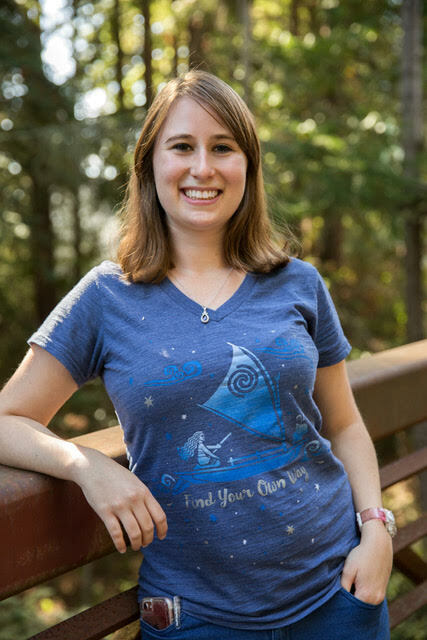 The merger of two neutron stars on August 17, 2017, generated gravitational waves detected by LIGO and a bright kilonova observed by UC Santa Cruz astronomers and others. 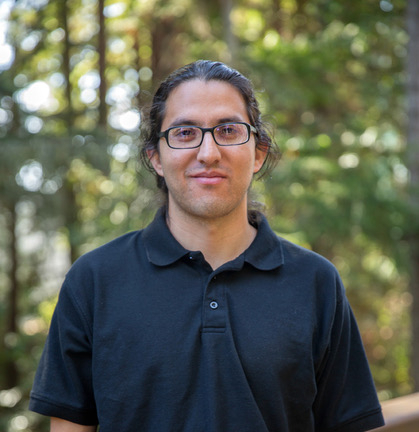 The merger drove the synthesis of heavy elements such as gold and platinum, and UCSC researchers calculate that neutron star mergers can account for about half of all the elements heavier than iron in the universe. 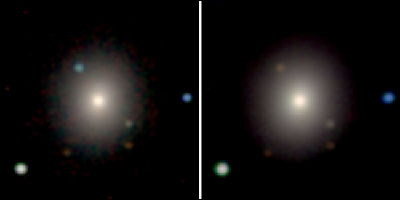 Material ejected during the merger of two neutron stars is thought to give rise to the visible light seen as a kilonova. The structure of the ejected material is shown in these snapshots from computer simulations, which show the ejecta close to the time when the kilonova emission is produced and at two different orientations (orbital plane on the bottom, perpendicular to the orbital plane on top). The structure of the ejecta depends on the relative masses of the merging objects, with two neutron stars of equal mass shown on the far right. 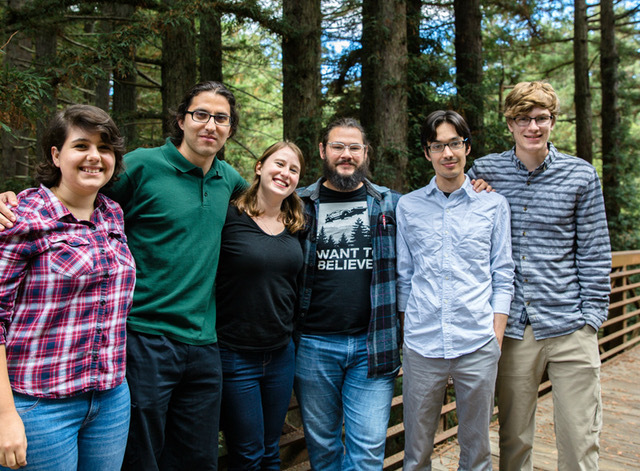 For the merger observed on August 17 (SSS17a), calculations predict a mass ratio close to 0.8.
Credit: 1M2H Team / UC Santa Cruz / Murguia-Berthier et al. 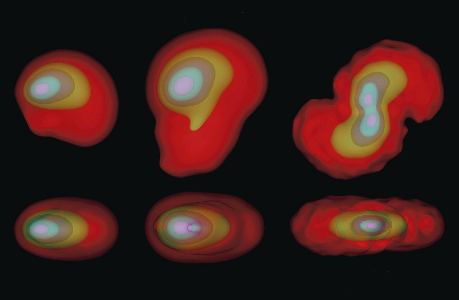 The violent merger of two neutron stars is thought to involve three main energy-transfer processes, shown in this diagram, that give rise to the different types of radiation seen by astronomers, including a gamma-ray burst and a kilonova explosion seen in visible light. 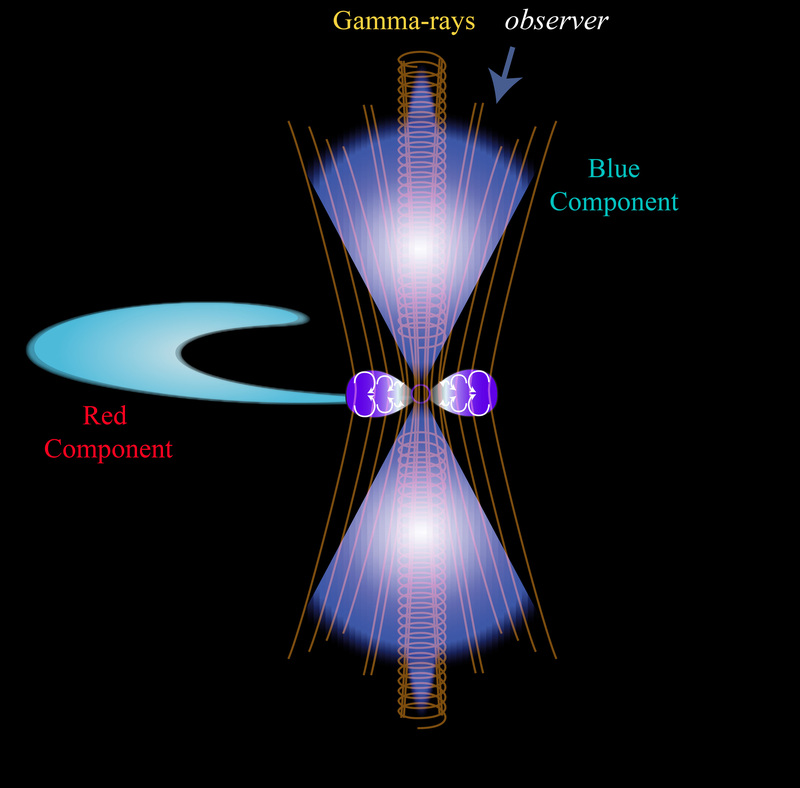 As the two stars spiral toward one another and merge to form a "hyper-massive" neutron star, a small fraction of the matter is ejected in a tidal tail (labeled "red component" in the diagram). The merger generates a short gamma-ray burst resulting from twin jets of material moving out from the rotational poles of the merger at close to the speed of light, likely triggered after the collapse of the remnant onto a black hole. In addition, an intense outflow of neutrinos from the hyper-massive neutron star drives a wind of material moving at about one-tenth the speed of light (labeled "blue component" in the diagram). 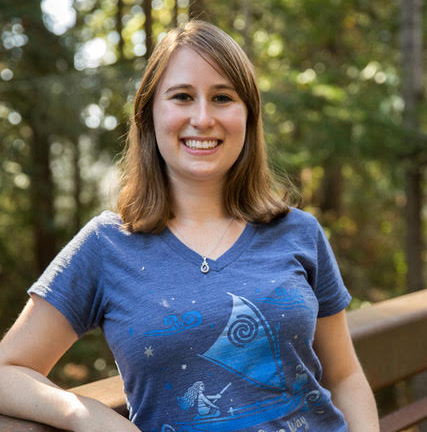 The blue and red wavelengths that dominate the light from the kilonova at different stages result from different elements in the ejected material, which is heated by radioactive decay processes. 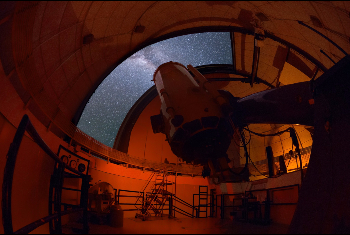 The 1M2H Collaboration discovered SSS17a using the 1-meter Swope Telescope at the Carnegie Institution's Las Campanas Observatory in Chile. 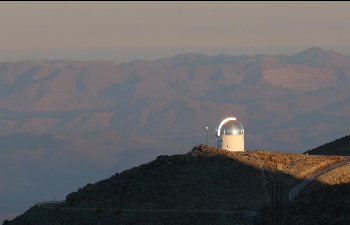 On August 17, 2017, The 1M2H Collaboration discovered the first optical counterpart of a gravitational wave event, SSS17a, using the 1-meter Swope Telescope at the Carnegie Institution's Las Campanas Observatory, Chile. While the object initially appeared bright and blue 10.9 hours after the neutron star merger, 4.5 days later it had faded and reddened significantly. 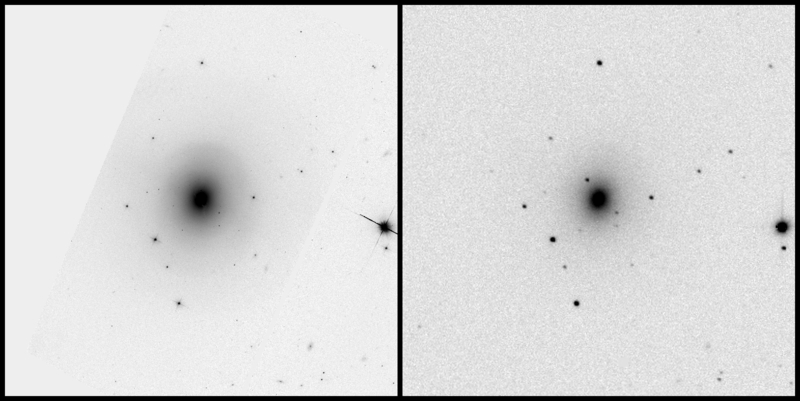 Galaxies observed, in chronological order, with the Swope telescope in the sky region showing the 90-th percentile confidence region for the location of GW170817. Galaxies are shown by black circles. SSS17a (represented by a blue star), was detected at 23:33 UT, 10.9 hours after the gravitational wave trigger by LIGO. Illustration of the radioactive debris cloud from a neutron star merger, expanding over a period of two weeks. 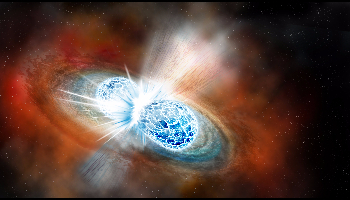 The illustration is derived from observations of the kilonova observations associated with GW170817. Lighter elements in the outer polar regions give rise to quickly fading blue light. Heavier elements in a surrounding donut and spherical core produce longer lasting red light. 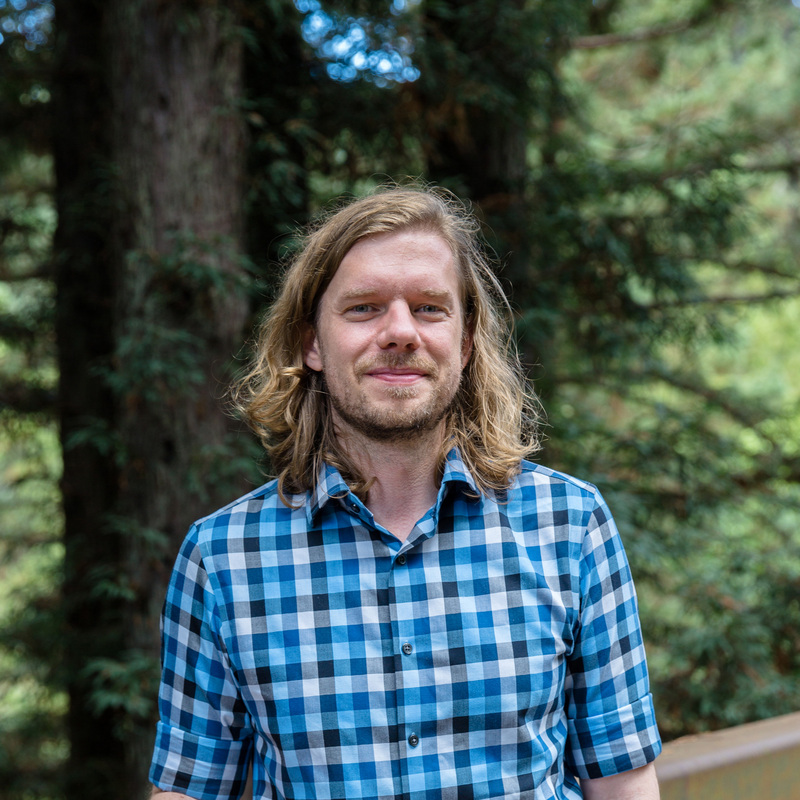 Theoretical calculation of the evolution of the spectrum of light from a kilonova such as that associated with GW170817. Over a period of two weeks, the light evolves from blue emission from lighter radioactive elements, to red emission from heavier radioactive elements. 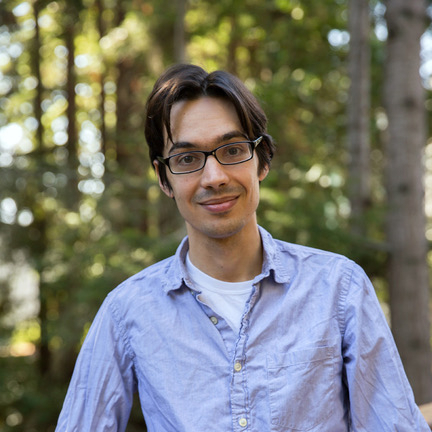 Theoretical calculation of the evolution of the spectrum of light from a kilonova such as that associated with GW170817. The right panel shows an illustration of the expanding radioactive debris cloud ejected from a neutron star merger that gives rise to the light. The emission quickly evolves from blue to red. Theoretical calculation of the blue and the red light from a kilonova, compared to observational data for the transient SSS17a associated with GW170817. The data agrees with theoretical predictions that the blue light should fade quickly over days, but that red light should persist for weeks after the merger. Theoretical calculation of the blue and the red light from a kilonova, compared to observational data for the transient SSS17a associated with GW170817. 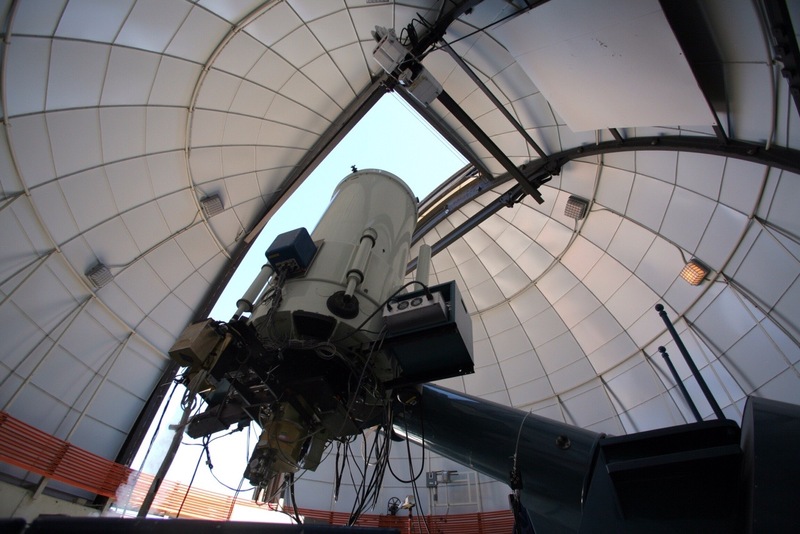 The data agrees with theoretical predictions that the blue light should fade quickly over days, but that red light should persist for weeks after the merger. 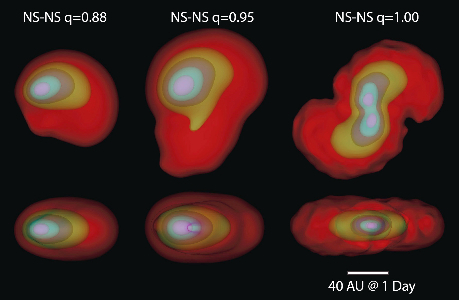 The right panel shows an illustration of the expanding radioactive debris cloud ejected from a neutron star merger that gives rise to the light. Lighter elements in the outer polar regions give rise to quickly fading blue light. Heavier elements in a surrounding donut and spherical core produce longer lasting red light. 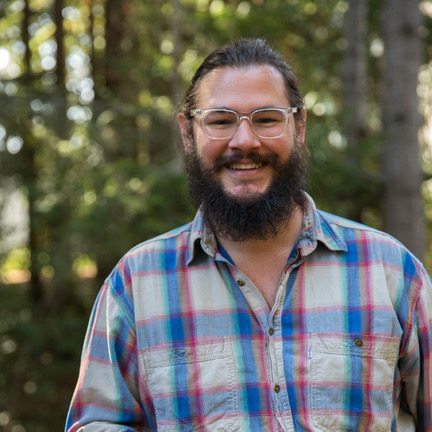 Ryan Foley, assistant professor of astronomy and astrophysics at UC Santa Cruz and principal investigator of the 1M2H Collaboration. 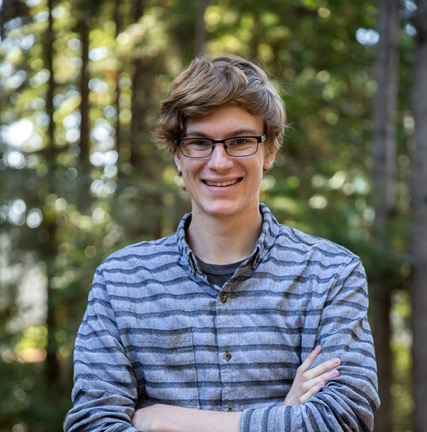 David Coulter, 2nd-year graduate student and first-author of Swope Supernova Survey 2017a (SSS17a), the Optical Counterpart to a Gravitational Wave Source, Coulter et al., published in Science. 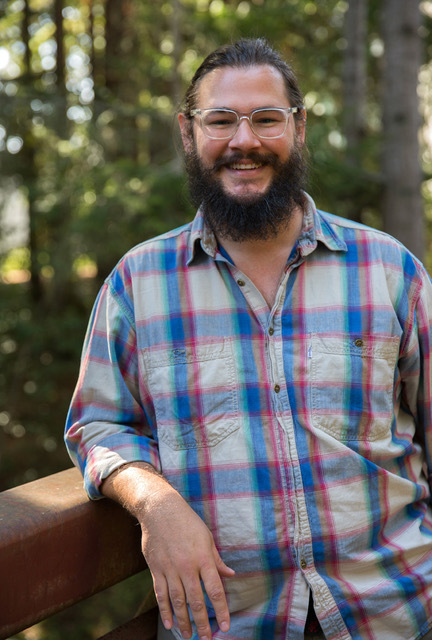 Charles Kilpatrick, post-doctoral scholar and first-author of Electromagnetic Evidence that SSS17a is the Result of a Binary Neutron Star Merger, Kilpatrick et al., published in Science. 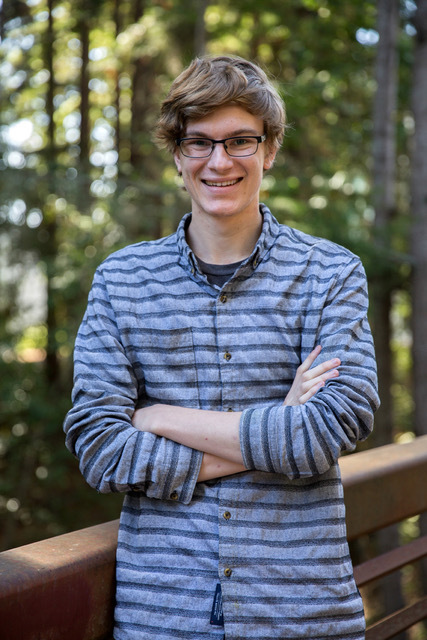 Matthew Siebert, 2nd-year graduate student and first-author of The Unprecedented Properties ot the First Electromagnetic Counterpart to a Gravitational Wave Source, Siebert et al., published in The Astrophysical Journal. 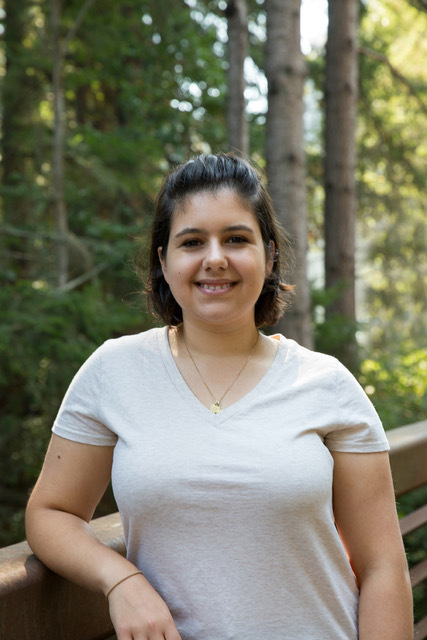 Ariadna Murguia-Berthier, 3rd-year graduate student and first-author of A Neutron Star Binary Merger Model For GW170817/GRB170817A/SSS17A, Murguia-Berthier et al., published in The Astrophysical Journal Letters. 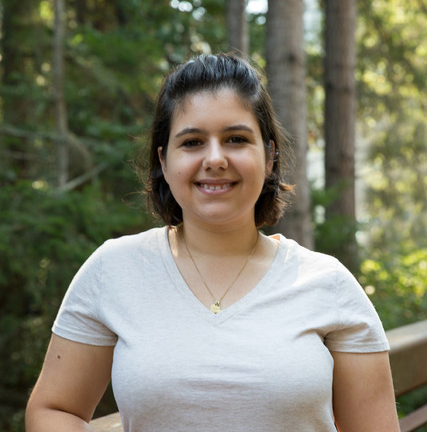 Enia Xhakaj, 1st-year graduate student and contributing author of The Old Host-Galaxy Environment of SSS17A, The First Electromagnetic Counterpart to a Gravitational Wave Source, Pan et al., published in The Astrophysical Journal. 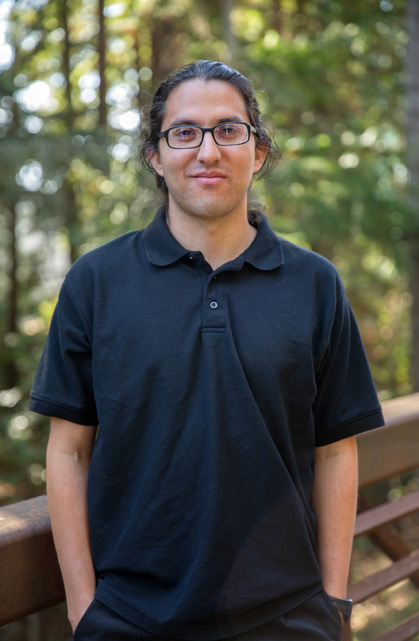 César Rojas-Bravo, 1st-year graduate student and contributing author of Swope Supernova Survey 2017a (SSS17a), the Optical Counterpart to a Gravitational Wave Source, Coulter et al., published in Science. 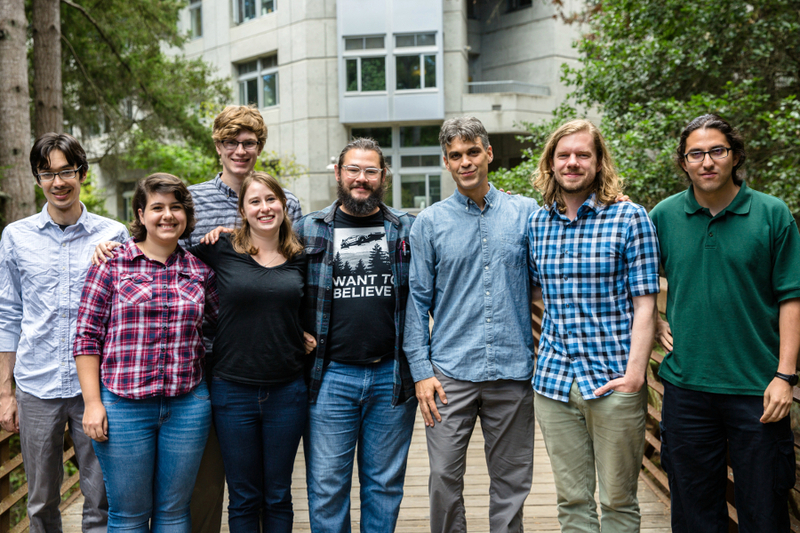 Members of Ryan Foley's 1M2H team at UC Santa Cruz include (left to right): Charles Kilpatrick, Enia Xhakaj, Matthew Siebert, Ariadna Murguia-Berthier, David Coulter, Enrico Ramirez-Ruiz, Ryan Foley, César Rojas-Bravo. (Missing from photo: Yen-Chen Pan). Youth Power. 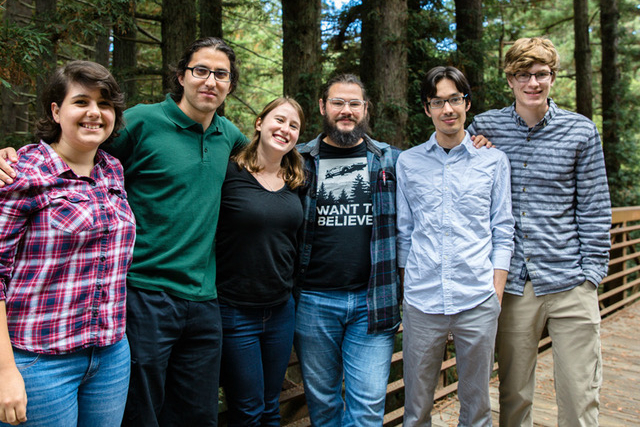 Junior members of Ryan Foley's 1M2H team at UC Santa Cruz include (left to right): Enia Xhakaj, César Rojas-Bravo, Ariadna Murguia-Berthier, David Coulter, Charles Kilpatrick, Matthew Siebert. 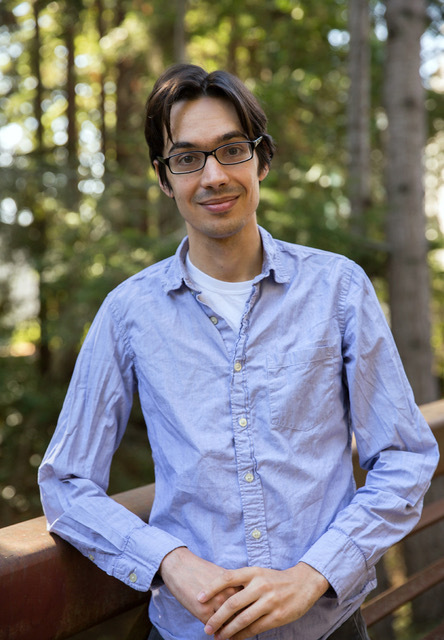 (Missing from photo: Yen-Chen Pan).